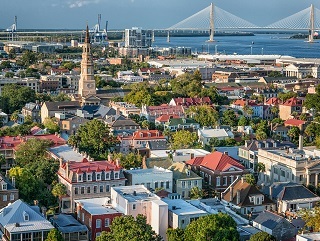 Charleston historic homes fetch some of the highest real estate prices in the Charleston area because home buyers are willing to pay top dollar to own a piece of Charleston's rich history. Most of these are located on the southeast side of the peninsula around the Charleston Battery. These homes are the most expensive and exclusive homes in Downtown Charleston. Home prices go up to $8 million plus depending on the location and the historic relevance of the property. With the exception of Old Village in Mount Pleasant, most of these homes are concentrated in historic neighborhoods of Downtown Charleston such as South of Broad, Harleston Village, the French Quarter, and Ansonborough. South of Broad is made up of all the homes south of the largely commercial Broad Street. The Battery and Rainbow Row are considered part of South of Broad. Harleston Village had the first golf club in the United States, even though it did not have a golf course. It is located near the College of Charleston and the Medical University of South Carolina (MUSC). The French Quarter gets its name from the French heritage of many of its former residents. It has the famous Dock Street Theatre and the only French Huguenot church remaining in the U.S. Ansonborough was Charleston's first suburb.